My random, hopefully interesting thoughts!! 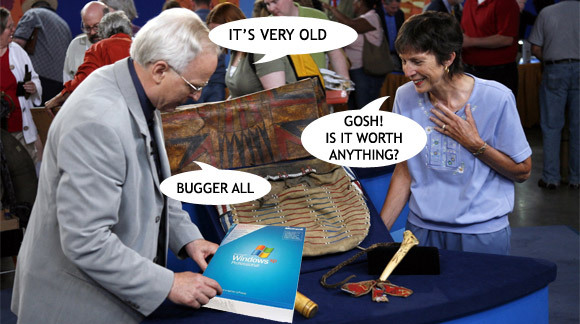 What is your Windows 7 strategy? My new favorite question !! “What is your Windows 7 strategy?” What appears to be a pretty straightforward question has led to some FANTASTIC discussions around Virtual Desktop opportunities lately. It’s been my recent experience that most companies have been on Windows XP a few years longer than they would like to be so Windows 7 is something that is at the forefront of their mind. Once the question is asked it usually starts moving towards a Virtual Desktop discussion (VDI) pretty quickly. I’ve found that Windows 7 migration is one of the largest catalysts to get the momentum moving on a VDI architectural discussion (the others being VDI-Security, desktop disaster recovery as well as ”bring your own computer” or BYOC). This makes sense since most of the time you buy a new PC with Windows 7 and not upgrade an existing desktop to Windows 7. This is especially true if the existing desktop hardware is at least two years old. The upside to the VDI and Windows 7 discussion is this: it’s about as good a time as any to move to VDI then at any other point in time. You already must replace the desktop hardware, so you might as well investigate the viability of virtualizing the desktop. Sometimes it takes a little more than just a Windows 7 strategy to get things moving. VDI also has some really nice side benefits like helping with local and remote users and their disaster recovery ramifications. For instance, for a few years I ran the Systems Engineering Group for my region at Xiotech. At the time I had 8 or 9 engineers and it never failed to happen that at least once a quarter someone’s laptop hard drive would crash, or better yet, get stolen – it always seemed that the AE’s had the most issues 🙂 . Each time that happened it took that SE or AE two or three days to get back up to speed and that’s if they had a good backup and we could ship them a replacement laptop quickly. If not, it was a week. What a VDI Architecture could have delivered was a “Desktop/Laptop Disaster Recovery process”. In this case, they could have simply stopped into a store such as BestBuy, Target, or Fry’s Electronics and purchased a laptop, walked into a Starbucks (WiFi) and downloaded the VDI client and away they would go. Now, if you don’t have remote users, think of the ability to swap out a failed desktop and have the end user up and running in an hour. It’s HUGE!!! The whole BYOC (Bring Your Own Computer) concept really can take this to the next level. Imagine the helpdesk team never having to image a laptop or desktop hard drive ever again. You give the end-users a set dollar amount and require them to pick up 2 or 3 years of 24/7 phone support on the laptop/desktop and just supply them with a remote desktop access. Let’s look at the security enhancements you get with a Virtual Desktop architecture. If you are a financial trading company, maybe you want to be able to lock down the company’s information as tightly as possible. If you are a K-12 or University facility, maybe you want to keep the students from altering the OS/applications that might affect the next student. The ability for a new desktop instance to be spawned at each unique login means that if a student loads a virus into the desktop, the next time someone logs in, they get a fresh, virus-free image. What seems to have gotten the most attention in these K-12 institutions is the ability to offer the “Computer Lab” applications to home users. Imagine a student logging into a VDI session from anywhere in the world and having the same level of access as if they were on campus. The same look/feel etc. Maybe the student has an iPad or a NetBook. They can then access the lab 24/7/365. If you look up Emprise in the Merriam-Webster dictionary you will see that it means “an adventurous or daring enterprise.” That pretty much describes the Emprise product family’s launch 2 years ago. We did something that no one else was, or is doing today. Imagine being able to start from scratch on a storage solution, and I’m not talking about controller software. I’m talking a complete re-engineering/architecting a solution that is built with enough resiliencies to offer the only zero-cost 5-year hardware warranty in the storage industry. Not only is it super reliable, but it’s ridiculously fast and predictable. When you can support 600+ Virtual Desktop (Performance VDI) “bootstorm” instances at a whopping 20 IOPS per bootup in 3U of space, I would classify that as wicked fast!!! In those 2 years we have not sat around on our laurels. Steve Sicola’s team, headed up by our VP of Technology David “Gus” Gustavsson, has really outdone themselves with our latest Emprise product launch. Not only did we move our entire user interface from “Web Services” to a RESTful API (ISE-Manager (blog about this later) and our iPhone/iPad App), he also released our 20(ea) 2.5” disk drive DataPac which has 40(ea) 2.5” drives in 3U of space for about 19.2TB’s space and a TON of performance. His team also released our ISE Analyzer (advanced reporting solution built on our CoreteX/RESTful API (www.CorteXdeveloper.com )– I’ll blog about that soon) and our next release of our Emprise product family, the Emprise 9000. I swear his team doesn’t sleep!!! So, the Emprise 9000 is a pretty unique solution in the market. Today, when you think “scale out” architecture the first thing you might think about is NAS. Hopefully our ISE NAS !! We hope moving forward you will also think of our Emprise 9000. The Emprise 9000’s ability to scale to 12 controllers puts it way above the 8 controllers the 3PAR solution scales to and above the 2-controllers the rest of the storage world produces (EMC Clariion, Compellent, HP EVA, IBM XIV etc). When married with our Intelligent Storage Element (ISE) it truly gives our customers the most robust, scalable solution in the storage market today. Let’s be clear, the Emprise 9000 is not just a controller update. It’s a combination of better, faster controllers, RESTful API and our ISE technology combined to solve performance starved applications issues like Virtual Desktops, Exchange, OLTP, Data Warehouse, Virtual Servers as well as various other types of applications found in datacenters today. The ability to give predictable performance whether the solution is 10% utilized, or 97% utilized is a very unique feature. Did I mention it comes with our free zero-cost hardware maintenance? 24x7x365 !!! Each controller has a Dual quad-core Nehalem CPU’s!! You can run both FC and iSCSI in the same solution. You want to migrate off that EMC, HP, 3PAR, HDS, etc – we can do it natively in our storage controllers. Scale-out architecture and why it is important when architecting a storage solution. I had an interesting discussion with an architectural firm the other day. Most of the discussion was around scaling for the future. In our discussion we talked about the linear scalability of the ISE technology and he pointed out that while that made a ton of sense for his block-access requirements he was a little concerned around the unstructured data, as well as some plans utilizing NFS for some of his server and desktop virtualization needs. The last thing he wanted to worry about was changing his architecture in 12 to 24 months due to growth or technology changes. So we started working on architecting a solution utilizing our new “scale-out” ISE-NAS solution. You’ve probably heard a lot about scale-out type architectures. 3PAR sort of led the way with their ability to scale out (at least to eight) their storage controllers to their fixed-backend backplane-attached disk drives and it offers up a pretty unique solution (at least in a block storage architecture). 3PARs problem is they don’t really have an answer for the same scalability around unstructured data (NAS). Don’t get me wrong, they list 5 NAS companies on their website, 1 is out of business and the other 4 have either been acquired by their competitors or is a straight up competitor. This scale out architecture seems to have caught on in the emerging NAS Gateway devices like Symantec FileStore and Isilon. Clearly both FileStore and Isilon are very different on the scale-out architecture. More below. So first things first, let’s describe what a “scale-out” architecture means, at least to me that is. When architecting solutions, it’s always important to put a solution together that can grow with the business. In other words, they know what they need today, and they have an idea what they might need in 12 months, but 24 – 48 is a complete crap shoot. They could be 5X the size, or just 2X the size but the architecture needs to be in place to support either direction. What is sometimes not discussed is what happens when you run out of either front-side processing power, backend IOPS or usable capacity? Most storage solutions give you 1 to 2(ea) clustered controllers, and a fixed number of disk-drives they can scale to dependent on the specific controller you purchase. From a front-end NAS solution most of them only scale to 2 nodes as well. If you need more processing power, more backend IOPS or capacity, you buy a second storage solution or you spend money to upgrade storage controllers that are not even remotely close to being amortized off the CFO’s books. If you look at the drawing above, you can clearly see what scale-out architecture should look like. You need more front-side processing, no problem. You need more backend IOPS or Capacity, no problem. They scale independently of each other. There is no longer the case of “You love your first <insert storage/NAS solution of choice> and you hate your third, fourth etc etc. Isilon is probably a great example of that. They tout their “scale-out” architecture but it clearly has some caveats. For example, If you need more processing power, buy another Isilon, you need more capacity buy another Isilon, you need more backside IOPS…well you get the idea 🙂 It’s not a very efficient “scale-out” architecture. It’s closer to a Scale up !! Let’s also not loose site on the fact that this is a solution that will need to be in place for about 4 to 5 years, or the amount of time in which your company will amortize it. The last thing you want to have to worry about is a controller upgrade, or net-new purchase because you didn’t size correctly or you under/over guessed your growth or even worse, years 4 and 5 hardware maintenance. This is especially true if the vendor “end of life’d” their product before it was written off the books !!! Cha-CHING. So this company I was working with fluctuates with employees depending on what jobs they are working on. It could go from 50 people to 500 people in a moment’s notice and while they would LOVE to size for 500, most of the time they were around 50 to 100. So as I mentioned above, we started architecting a solution that incorporated our ISE-NAS solution based on Symantec’s FileStore product. When coupled with our Emprise 5000 (ISE) gives them the perfect scale-out solution. They can start with 2-nodes and grow to 16 by simply adding NAS engines (x86) to the front end. If they need more capacity, or backend IOPS, we can scale any direction independent of the rest of the solution. Coupled with our predictable performance we gave them the ultimate ability to size for today, and know exactly what they can scale to in the future. In the world of “Unified Storage”, cloud computing and 3 to 5 year project plans, its important to consider architecture when designing a solution to plan for the future. Scale-Out architecture just makes a lot of sense. BUT – do your homework. Just because they say “scale-out” doesn’t really mean they are the same. Dual-Clustered controllers – or even eight-way – will eventually become the bottle neck and the last thing you want to worry about is having to do a wholesale swap-out/upgrade of your controller nodes to remove the bottleneck or worse, have to buy a second (or third) storage solution to manage!! Stalled Virtualization Projects? – How Xiotech can help you UN-STICK these deployments. Xiotech is in a huge partner recruitment phase this year. Things have been going just fantastic! However, one problem we are running into is trying to get some of these larger partners to give us the time of day. Shocking I know- who wouldn’t want to carve out 60 mins of their time to talk to “Ziotech” (I didn’t misspell that – it happens to us ALL THE TIME). Once we get our foot in the door it’s usually 20 mins of them explaining that they carry EMC, NetApp, Pillar, HDS, and Compellent, etc. They always explain to us they just can’t take on yet another storage vendor. What’s really interesting is we typically tell them we don’t want to replace any of their current storage offerings. This usually leads to a skeptical look from them 🙂 I usually tell them that we have a very unique ability to “un-stick” Virtual Desktop opportunities. Let me explain a little further. It never fails- VDI projects seem to get stalled, or simply get stuck in some rut that the prospect or partner can’t get out of. Now, a stuck project can come in many shapes and sizes. Sometimes it’s time and effort, sometime it’s other projects in the way. But the vast majority of the time its Cost/ROI/TCO type things. Not just from a justification point of view, but most of the time from the upfront CAPEX view. This has been especially true with 1000+ seat solutions. Like I said, I just keep hearing more and more about these situations from our partners. What normally follows is, “well the project is on hold due to funding issues.” So how can we differentiate ourselves in this kind of opportunity? Funny you should ask that!! I typically like to describe our ISE solution as a solution that has a VERY unique ability to do 3 things better than the rest. #1 – We give you true cost predictability over the life of the project. Let’s be honest, if you are about to deploy a 5000+ VDI desktop solution you are probably going to do this project over a 3 year time frame right? Even if it’s only 500, why is it that as we look into these solutions further we only see 3 years of maintenance on the most expensive CAPEX which is storage? By the time you get all 5000+ systems up and running it’ll be time for year 4 and 5 maintenance on your storage foundation. If this isn’t your first storage rodeo, then you know that years 4 and 5 can be the most painful in regards to costs. Not to mention, what’s really cool about our solutions is the “Lego” style approach to design. We can tell you what the cost is for each ISE you want to buy, since they are in 3U “blades” you can simply add the number you need to meet whatever metric you have in place and know the cost of each one. As you can see, we do “Cost Predictability” pretty well. #2 – We give you performance predictability. With our 3U Emprise 5000 we have the very unique ability to predict performance characteristics. 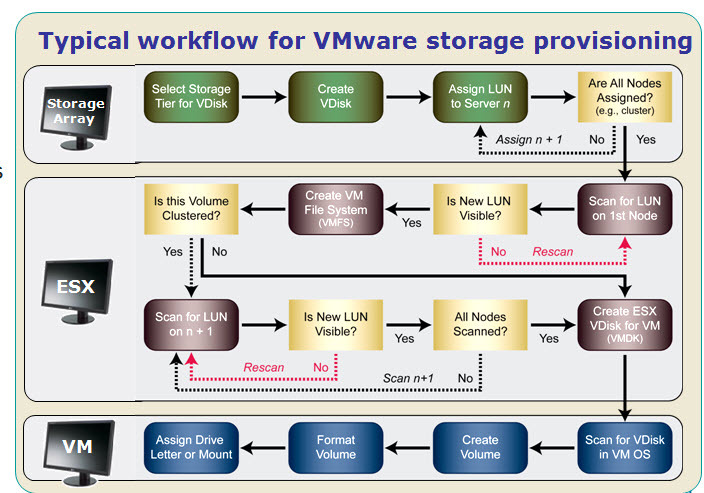 This is very difficult with legacy storage vendors. Their array IOPS pool can swing 80% plus or minus depending on how full from a capacity point of view their solution is. We deliver 348 SPC-1 IOPS per SPINDLE based on 97% capacity utilization. Keep in mind most engineers for legacy storage arrays use 150 to 120 IOPS per spindle. So based on that alone, we can deliver the same performance with ½ the spindles!! #3 – We can give you capacity predictability. Because of the linearity of our solution, when you purchase the Emprise 5000 we can tell you exactly how much useable, after RAID capacity you will have available. Best practice useable capacity for our solution is 96% full. That’s where we do all of our performance testing. Compared with the industry average of anywhere from 60% to 80% your capacity “mileage” will vary !! So why should this be important to solution providers and customers? So back to my VDI comments. If you are in the process of evaluating, or even moving down the path to deploy VDI how important is it for you to fully understand your storage costs when trying to design this out? If I could tell you that you can support 2000 VDI instance in 3U of space, and that 3U of space can hold 19TB’s of capacity and that solution cost $50,000 (I’m pulling this number out of the…..well, air) that could really be a pivotal point in getting your project off the ground don’t you think? Like I said, no one deploys a 5000 seats solution at one time. You do this over a number of years. With our Storage Blades, you can do just that. You simply purchase the one ISE at a time. With its predictable costs, capacity and most importantly, it’s predictable performance you have the luxury of growing your deployment overtime, without having to worry about a huge upfront CAPEX hit. Not to mention a 5 year hardware warranty better aligns with the finance side of the house and their typical 5 year amortization process. No hidden year 4 and 5 Maintenance costs !! So, if you are looking at a VDI project or you’ve looked at it in the past and just couldn’t justify it, give us a call. Maybe we can help lower your entry costs and get this project unstuck !! How Xiotech Storage Blades have the potential to change the storage paradigm. It’s inevitable, whether I’m talking with a value added reseller (VAR) or a net-new prospect, I’m always asked to explain how our solution is so different then everyone else’s. I figured it was a great opportunity to address this in a blog post. Xiotech recently released a whitepaper authored by Jack Fegreus of OpenBench Labs. His ISE overview was so spot on that I wanted to copy/paste some of the whitepaper here. I would encourage you to read his full whitepaper as well, which includes his testing results. I’m pretty sure you will be as impressed as I was. Before you continue reading, I need you to take a moment to suspend everything you understand about storage architecture, both good and bad. I would like you to read this post with an open mind, setting aside your biases as much as possible. If you can do this, it will make a LOT more sense. The heart of ISE—pronounced, “ice”— technology is a multi-drive sealed DataPac with specially matched Seagate Fibre Channel drives. The standard drive firmware used for off-the-shelf commercial disks has been replaced with firmware that provides detailed information about internal disk structures. ISE leverages this detailed disk structure information to access data more precisely and boost I/O performance on the order of 25%. From a bottom line perspective, however, the most powerful technological impact of ISE comes in the form of autonomic self-healing storage that reduces service requirements. In a traditional storage subsystem, the drives, drive enclosures and the system controllers are all manufactured independently. That scheme leaves controller and drive firmware to handle all of the compatibility issues that must be addressed to ensure device interoperation. Not only does this create significant processing overhead, it reduces the useful knowledge about the components to a lowest common denominator: the standard SCSI control set. Relieved of the burden of device compatibility issues, ISE tightly integrates the firmware on its Managed Reliability Controllers (MRCs) with the special firmware used exclusively by all of the drives in a DataPac. Over an internal point-to-point switched network, and not a traditional arbitrated loop, MRCs are able to leverage advanced drive telemetry and exploit detailed knowledge about the internal structure of all DataPac components. What’s more, ISE architecture moves I/O processing and cache circuitry into the MRC. A highlight of the integration between MRCs and DataPacs is the striping of data at the level of an individual drive head. Through such precise access to data, ISE technology significantly reduces data exposure on a drive. Only the surfaces of affected heads with allocated space, not an entire drive, will ever need to be rebuilt. What’s more, precise knowledge about underlying components allows an ISE to reduce the rate at which DataPac components fail, repair many component failures in-situ, and minimize the impact of failures that cannot be repaired. The remedial reconditioning that MRCs are able to implement extends to such capabilities as remanufacturing disks through head sparing and depopulation, reformatting low-level track data, and even rewriting servo and data tracks. ISE technology transforms the notion of “RAID level” into a characteristic of a logical volume that IT administrators assign at the time that the logical volume is created. This eliminates the need for IT administrators to create storage pools for one or more levels of RAID redundancy in order to allocate logical drives. Also gone is the first stumbling block to better resource utilization: There is no need for IT administrators to pre-allocate disk drives for fixed RAID-level storage pools. Within Xiotech’s ISE architecture, DataPacs function as flexible RAID storage pools, from which logical drives are provisioned and assigned a RAID level for data redundancy on an ad hoc basis. What’s more, the ISE separates the function of the two internal MRCs from that of the two external Fibre Channel ports. The two FC ports balance FC frame traffic to optimize flow of I/O packets on the SAN fabric. Then the MRCs balance I/O requests to maximize I/O throughput for the DataPacs. In effect, Xiotech’s ISE technology treats a sealed DataPac as a virtual super disk and makes a DataPac the base configurable unit, which slashes operating costs by taking the execution of low-level device-management tasks out of the hands of administrators. This heal-in-place technology also allows ISE-based systems, such as the Emprise 5000, to reach reliability levels that are impossible for standard storage arrays. Most importantly for IT and OEM users of the Emprise 5000 storage, Xiotech is able to provide a five-year warranty that eliminates storage service renewal costs for a five-year lifespan. Now, I’m going to keep this same open mind when I say the following: the Emprise 5000 storage blade just makes storage controllers better. We make one and we’ve seen it first-hand. We saw a significant jump in performance once we moved from the typical drive bays and drives that everyone else uses with the ISE. Not to mention, with its native switch fabric architecture, it allowed us to scale our Emprise 7000 storage controllers to 1PB of capacity. What’s really cool (open mind for me) is we’ve improved performance and reliability for a lot of storage controllers like DataCore, FalconStor, IBM-SVC and HDS USP-V, not to mention significant boosts as well for applications and OS’s. 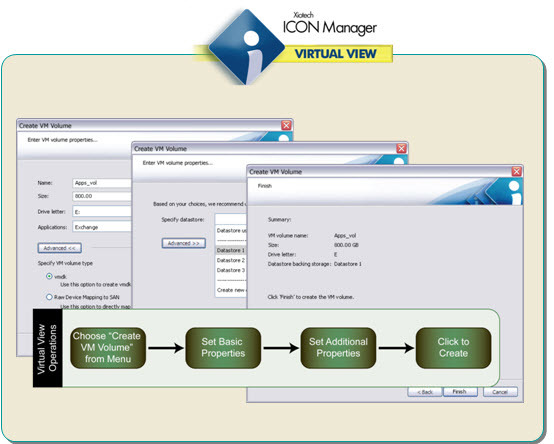 Xiotech Virtual View for VMware, HyperV and Citrix. If you are a VMware Admin, or a Hyper-Visor admin from a non-specific point of view, Xiotech’s “Virtual View” is the final piece to the very large server virtualization puzzle you’ve been working on. In my role, I talk to a lot of Server Virtualization Admin’s and their biggest heartburn is adding capacity, or a LUN into an existing server cluster. With Xiotech’s Virtual View it’s as easy as 1, 2, 3. Virtual View utilizes CorteX (RESTful API) to communicate, in the case of VMware, to the Virtual Center appliance to provision the storage to the various servers in the cluster. From a high level, here is how you would do it today. I like to refer to the picture below as the “Rinse and Repeat” part of the process. Particularly the part in the middle that describes the process of going to each node of the server cluster to do various admin tasks. With Virtual View the steps would look more like the following. Notice its “wizard” driven with a lot of the steps processed for you. But it also gives you an incredible amount of “knob turning” if you want as well. And for those that need to see it to believe it, below is a quick YouTube video Demonstration. If you run a VMware Specific Cluster (For H.A purposes maybe) of 3 servers or more, then you should be most interested in Virtual View !!! I’ll be adding some future Virtual View specific blog posts over the next few weeks so make sure you subscribe to my blog on the right hand side of this window. !! If you have any questions, feel free to leave them in the comments section below. This is a pretty cool video done by the Technical Marketing team at Xiotech. 10,000 Exchange users in 3U of space!! No fancy/expensive SSD needed for this !! In 3U of space. Now that’s WICKED FAST !!! By the way, if by chance 10,000 is just not enough users for you. Don’t worry, add a second ISE and DOUBLE IT TO 20,000. Need 30,000, then add a THIRD ISE. 100,000 users in 10 ISE or 30U of RackSpace. Sniff Sniff….I love it !!!!!!!!!!!! 24GB of cache <—- WOW !!!!! 13 50GB SSDs <— I’m going to guess that these aren’t very cheap. Hitachi AMS 2300 = 10,800 users – 400+ Pages PLUS !!! <– I have to say it again, WOW 400+ pages on this bad boy !!! 240 300GB 15K RPM SAS disks, <— Ahh ya – TONZ of spindles !!! We had 20(ea) 3.5″ Drives to do our testing. 8(ea) 4Gb/s Fibre Channel paths was used for these tests. Windows Server 2003 R2 Enterprise x64 with Service Pack 2. Subscribe to my BLOG !! !